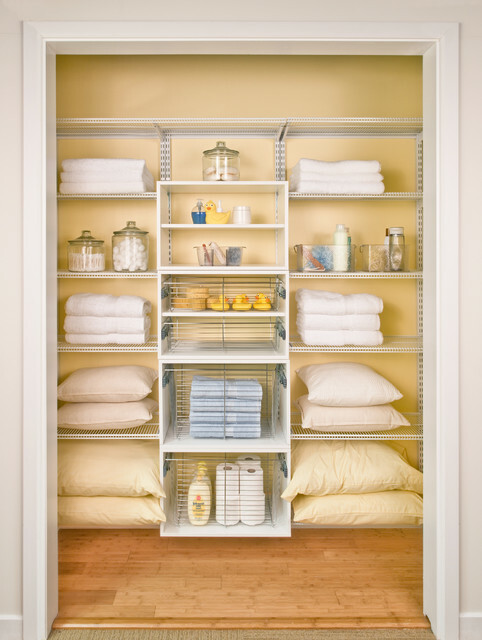 Organized Living freedomRail is a practical and economically solution for any linen closet. Use freedomRail ventilated shelves to make items easy to see and incorporate freedomRail O-Boxes with chrome baskets to keep linens and supplies separate. Dimensions? - What are the dimensions of this closet? This closet is 72" wide. Here is a link to our design tool if you would like to try and design your closet. Organization. Pillows lay flat on the floor. The Most Beautiful Linen Closet!